*NOTE: This is for birthdays, anniversaries, etc. only. If you have a community event you would like to publicize you can submit it on the Community Bulletin Board page under COMMUNITY. Know somebody who has a special occasion coming up? Wish them a happy birthday, anniversary, or congratulate them on PCRO RADIO. 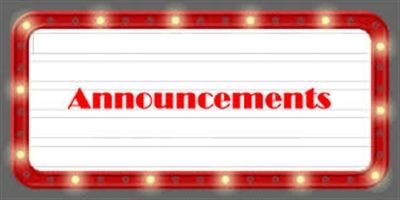 Announcements can be heard on-air at 10:00 a.m., Monday through Friday. Miss Isabel is turning 100! From All The Staff At PCRO Wishing The Birdman A Happy Birthday On February 23rd.